This Stargazer Neon Gel Colour is a must have if you want temporary vibrant colour flashes in your hair! This neon gel colour in orange features a fantastic comb end for easy application and is perfect for creating vivid and vibrant colour flashes! This neon gel colour in red features a fantastic comb end for easy application and is perfect for creating vivid and vibrant colour flashes! 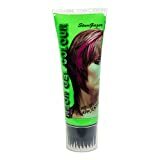 Transform your hair with this easy to use hair gel perfect for 80’s neon themed hen parties. Add this fun neon makeup- fancy dress accessory to your neon costume to create a look never seen before! Stargazer Neon Hair Gel is UV reactive. The gel can be used to cover whole head or individual strips of hair to give the illusion on highlights. The gel is easily applied with the especially designed brush applicator. The gel washes out of the hair after one wash. This gives the flexibility to change hair if required. Apply to dry hair.